It’s been cloudy a lot this season, but the rain has kept pretty much to a reasonable number of rainy days and single downpours—it hasn’t been too WET. So, not that much fieldwork called for rain. Today was an exception, with a steady on-and-off drizzle from early morning that kept things watered down. Lynn came out around 8:30 am to weed. Since it didn’t look like the sun would be showing up to dry things out, she finished a bed of onions (these are the last-planted onion seedlings, a fair bit behind the rest) and we called it a day for weeding. 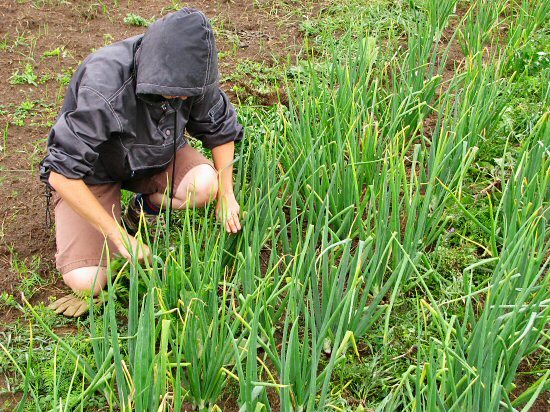 In general, we try not to handle plants when they’re wet so as not to spread any sort of disease. This is a common caution for, for example, beans, and I’m not sure how it applies across the board to all garden veggies. Still, since wet work in the field is seldom fun anyway, it seems like a good rule in general: No weeding when wet! I’m definatley with you on that rule ‘no weeding when wet’. Sorry to hear you are experiencing such poor weather too, it really makes you feel down, doesn’t it. We only have an allotment though you have a farm (albeit ‘Tiny’). Know how you feel – it’s been crazy here in Northern Kentucky, too! Coolest July on records since the 1930’s. We’re usually canning and drying tomatoes by now, but we’re waiting for them to turn red… and the bees- well, with all of the rain, they haven’t finished capping the honey and are eating it since they can’t get out of the hive to work! We just had the 3rd coolest July in Manitoba since records began. I`m beginning to wonder if I`ll even get a red tomato! I hope so! It’s been so wet here in the Northeast that I can’t follow that rule, sadly. It’s been wet all summer so far, very very wet. My tomatoes and potatoes have awful blight and all of my tomatoes are still green. I was just reading about the late blight disaster in the August issue of Growing for Market…all traced to mass produced tomato transplants. The editor of the magazine is drawing comparisons between the crazy food system we have and the cheap bedding plants. What a crazy world we live in! Maybe we’ll see a resurgence of locally grown small scale greenhouses popping up everywhere. I hope so! Hi – It won’t stop raining here in the UK, either. Earlier in the summer it looked like it was going to be perfect – hot sunny days and just enough rain overnight – but that didn’t last long. It looks like my best crop this summer is going to be slugs – again! Hope it cheers up for you guys soon. I just read the latest garden update from Mike at Plan Be in South Africa. They got a bit of a break (46mm of rain) from ongoing drought. He ends the post: “I believe that this new climate-regime is permanent. This is our New Normal weather. Welcome to it; Adapt Or Die.” Yikes! I love Blue Fox motto too … very catchy, yet very loaded. Your onions are looking pretty good to me, considering how late they where planted. I visited the tiny farm of a friend last week, in zone 4a, and his onions started from sets where just starting to bulb. Of course, they where planted tardively for a late harvest, but then, they where coming along just fine. Funnily, he had predation from deers on his onions, and says it’s a first this year. It’s scary to think the deers are developping a taste for allium!